Michael Rowland creates elegant and durable leather goods. It is no small feat to keep a creative studio in operation for 40 years, but Merrickville’s Michael Rowland has done just that. Rowland creates elegant and durable leather goods, and has built a loyal following of customers in Canada and around the world. In 1989, he opened Rowland Leather, in Merrickville, Ontario. However, all good things must come to an end. After 28 years, Rowland Leather’s doors will close sometime this fall. 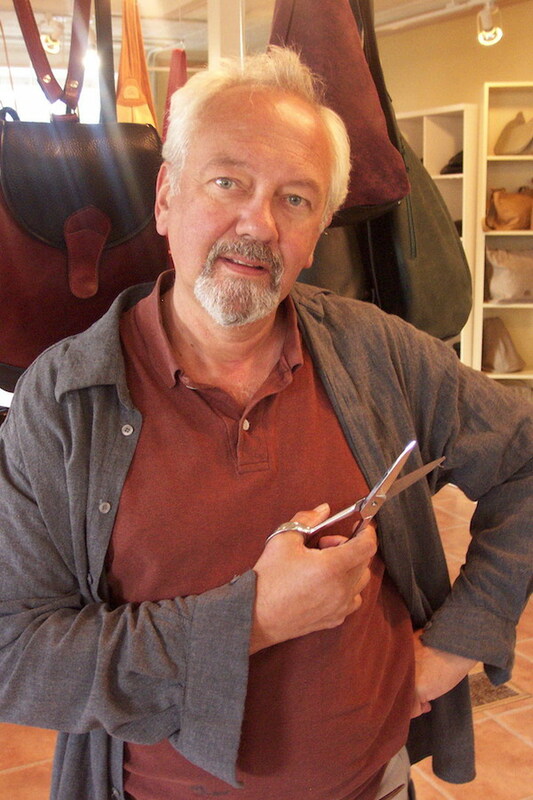 Since 1974, Michael Rowland has been making gorgeous leather handbags, innovative backpacks, and designer flight bags. When Michael Rowland opened Rowland Leather, Merrickville was very quiet, home to only a few restaurants and stores. Initially, Rowland only had his own work in the shop, but gradually he added products from other Canadian producers, such as Garneau slippers – made in Quebec, Keldon belts – made in Toronto, Tilley hats – made in Toronto, as well as other leather products from around the world. Rowland Leather has attracted customers with an eye for timeless design and quality materials. In 2011, Rowland made the trip of a lifetime when he was invited to Iqaluit by the Nunavut Crafts Council to share his knowledge and expertise with seamstresses from across Nunavut. Skilled at making beautiful and practical garments out of sealskin and fur, the women were keen to round out their repertoire by learning how to work with their leather to produce bags Rowland chronicled his journey in a beautifully rendered book called Iqaluit 2011, which is on display at Rowland Leather. Michael Rowland’s unstoppable creativity led him, in 2013, to open luxurious guest suites above his store; he is the designer-owner of the Merrickville Guest Suites boutique hotel which will remain open. The Suites offer a location that visitors can come to for relaxation and comfort while they enjoy the artistic creativity that Merrickville is known for. He designed the suites and worked with several local tradespeople and artists to create a wonderful space for guests to spend a night, a weekend, or a week. “Rather than the country charm look that is popular here I wanted more of a European feel in the suites. I have a collection of photos that I have taken of the Rideau Canal system over the past few years. I printed and framed the best of them and hung them in the Suites. “ says Rowland.